Indiana University East will present Indiana University Honorary Doctor of Humane Letters to Craig Kinyon and Charlie Nelms during its 48th Commencement Ceremony on Friday, May 10. Indiana University President Michael A. McRobbie will confer the honorary degrees at the ceremony. The honorary degree, the highest academic recognition Indiana University can bestow, is awarded to individuals who demonstrate the highest standards of personal integrity and sincere concern for the public good. In addition, candidates for the honorary degree generally have significant ties to the state of Indiana or to Indiana University. Through this high honor, IU seeks to recognize individuals who may serve as role models for students, faculty, alumni and the people of the state of Indiana. IU East Chancellor Kathy Cruz-Uribe said it will be an honor to present Kinyon and Nelms with the honorary degrees. Kinyon is the president/CEO of Reid Health, the region’s largest employer. The hospital provides clinical experiences for IU East nursing students, internship opportunities, is a partner in providing education rotations for IU School of Medicine third- and fourth-year clerkship students. Under Kinyon’s leadership, Reid Health has supported numerous campus projects such as the completion of the Student Events and Activities Center as well as the purchase of simulation lab equipment for the nursing program. He is an active member of the IU East Board of Advisors. Kinyon serves on the Preble County Development Partnership board as treasurer, Vizient Central board as chair, and he is vice president of the Crossroads Health Services Reciprocal board. He is a board member of the Earlham College Community Partnership, West End Bank, Indiana Chamber of Commerce, the Tecumseh Health Reciprocal Risk Retention Group. 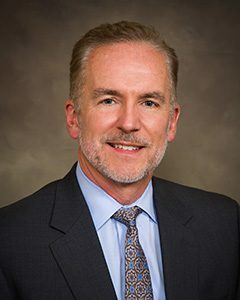 He is also a member of Richmond’s Alliance for Strategic Growth, Forward Wayne County, American Hospital Association, Indiana Hospital Association, Indiana Rural Health Association, American Institute of CPAs and Indiana CPA Society. Kinyon has received honors for his leadership role at Reid Health, including an American Hospital Association’s Grassroots Champion Award, which recognizes hospital leaders who most effectively educate elected officials on how major issues affect the hospital’s vital role in the community. He also received the Indiana Hospital Association’s Distinguished Service Award. Kinyon received his B.A. in Accounting from Grove City College, Grove City, Pennsylvania. Nelms is Chancellor Emeritus of IU East and has provided years of extensive service to Indiana University. He served IU East as its third chancellor and a professor of education from 1987-1994. In addition, Nelms served IU for more than 20 years in numerous capacities, including associate dean for academic affairs and chief student affairs officer at IU Northwest, vice president for institutional development and student affairs at IU Bloomington, and professor of higher education. From 2007 to 2012, he served as the chancellor of North Carolina Central University in Durham, North Carolina. Currently, Nelms is a higher education consultant who provides expertise in leadership, intuitional effectiveness, strategic planning and diversity and inclusion. He has also provided tremendous volunteer leadership to local, state and national organizations. He currently serves as a Trustee for the Charles Stewart Mott Foundation and as a member of the Howard Hughes Medical Institute STEM Advisory Committee. Nelms has previously received honorary degrees from Earlham College in 1993 and the University of Arkansas at Pine Bluff in 2001. 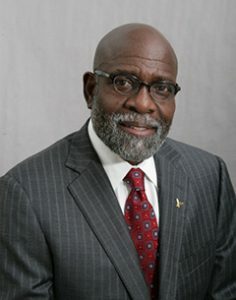 He has also received the Distinguished Alumni Award from both Indiana University and the IU School of Education, the State of Indiana Sagamore of the Wabash and the American Association of Blacks in Higher Education Delaney Distinguished Leadership Award. In 2012, President Obama honored Nelms with the MLK Drum Major for Service Award for helping to address the most pressing needs of our communities and nation. Nelms received his Master of Science in Higher Education and Student Affairs and his Ed.D. in Higher Education Administration from IU. He received his bachelor’s degree in agronomy and chemistry from the University of Arkansas at Pine Bluff.